I guess you could call pickled shrimp a quick pickle, and they are not at all difficult to make, yet the presentation gives the impression of difficulty. They do need to sit for a few days for the flavors to meld, and tend to just get better and better. Think about the drop-in folks you will see this month, and you will have an instant nibble for them. They make a great snack for the tree-trimming event, or for some Christmas Eve fun. As a hostess gift? Wonderful. Perfect for a New Year’s Eve celebration, or part of a spread for bowl game watching, and they can continue into Super Bowl and Valentine’s Day. 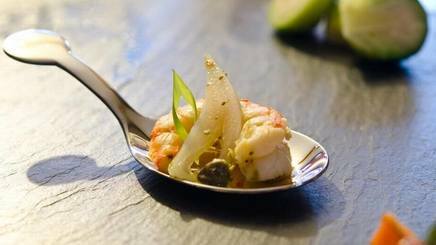 Also use the shrimp as a garnish for soup or the base of a salad, even as a little treat garnish for most any meal.